The legends of the Greek gods are pretty timeless, with countless films still inspired by the gods of Olympus, half-human heroes and terrifying monsters. Slots developers have been similarly inspired over the years, and renowned slot developer Amaya are the latest firm to slip on their sandals and don their magic shields to bring some of the power and magic of the myths to casino players on the web. Some of the top slots titles around on the market such as the recently released Zeus III by WMS Gaming and the well-received Golden Goddess slot from IGT prove the popularity of Greek mythology-themed slots. 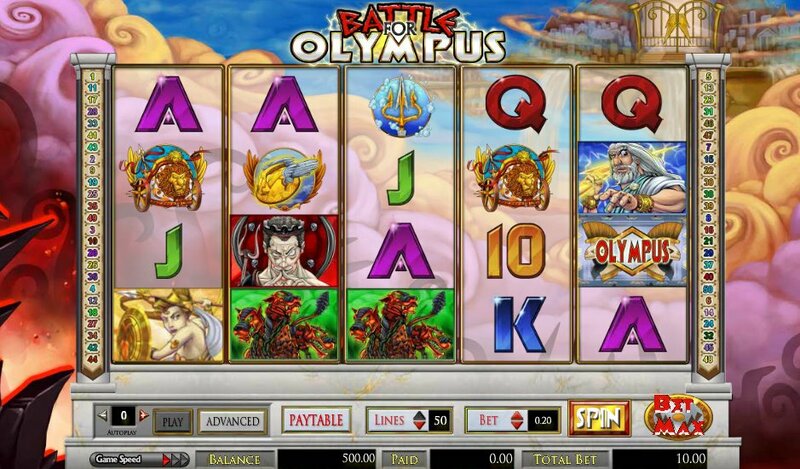 Battle for Olympus is a 5 reel, 50 pay-line slot with plenty of oomph and lots for the bigger bettors to get their teeth into. On the reels it’s pretty all-round affair in terms of Greek mythological imagery: Zeus – obviously – is the top payer, with a 2,000-coin jackpot paid out for five symbols. Also paying out a $20,000 jackpot at the top end of the betting spectrum is the Hades icon. What’s good in this slot is that you can earn wins for mixing up icons, so Hades and Zeus will pay together in winning combos. Other than those two likely lads on the reels we get a golden chariot, Hermes’ winged gold helmet and Poseidon’s trident. And, of course, there are 10-through-Ace symbols. The Wild is the three-headed dog, Cerberus – the legendary guardian to Hades – who subs for all symbols other than the Scatters and Bonus icons and trebles all winning combos it helps form. The Scatter is the mighty goddess, Athena, with five Scatters anywhere paying out a jackpot of 250x your line bet. Look out too for the three bonus symbols, ‘BATTLE’, ‘FOR’ and ‘OLYMPUS’. If you hit those three Scatters on reels 1, 3 and 5 you’ll trigger the game’s bonus feature. Start off by choosing between Zeus and Hades and watch the two mythical middleweights face off in the battle of a lifetime. You take five attacks at your opponent, and here a little skill comes in – you must line up the tack symbol underneath your warrior’s icon in order to land a perfect blow. Landing decent hits will see your opponent’s life meter drop much more quickly. This is certainly a game for the big hitters, and we’re not just talking about the warring gods who form the slot’s center piece. With a potential $500 bet per spin available you’ll need to bring your biggest wallet to whatever online casino you find Battle for Olympus at. For that outlay, therefore, I would liked to have seen a little more reward for players’ commitment – one bonus round, albeit a pretty tasty affair – isn’t really enough in a new online slot. Even an added free spins round would have been nice. I actually found most of my decent wins coming via the generous 3x Wild in the base game. That said, the graphics are nice, the overall theme attractive, the music suitably heroic, and the animation on winning combos slick. However, there are better Greek myth-themed slots out there right now, with Microgaming’s 25 pay-line slot, Mount Olympus - Revenge of Medusa, with its Free Spins Bonus my personal favorite. Meanwhile, Bally's legend-themed Cupid and Psyche gives both that and this game a run for their money.